a specially-designed, thin fast-flexing face added to the new vibration and sound control system to get the precise feel of a blade. I normally play blades, but I wasn’t put off by the look of the RBZ, which is a common occurrence when you first pick up a game-improving iron. I’m of the opinion that TaylorMade haven’t tried to cram in all the game-improvement technology out there at the expense of the look of the club. Okay, I know you’re probably thinking: if a club can help me break 100/90/80 I don’t care what it looks like. Which is probably true, but if you can achieve both, like the RBZ, it has to be a bonus. The 3-5 irons also utilise a two-piece metalwood construction, helping them obtain a low centre of gravity (CG) and a high moment of inertia MOI, giving you more forgiveness in the longer irons with a high but penetrating ball flight. 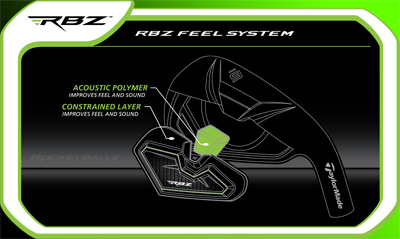 Two other pieces of technology that have been incorporated into the new RBZ are: the re-engineered face structure with Toe-Bar located at the upper-toe area, which helps bring the clubface square at impact; and the Inverted Cone clubface technology helping expand the club’s coefficient of restitution (COR) zone, which promotes increased ball speed and distance. If you’re a mid to high handicapped golfer looking for a club that will help you improve your game and confidence, then I would recommend you get down to your local pro and take these for a test. 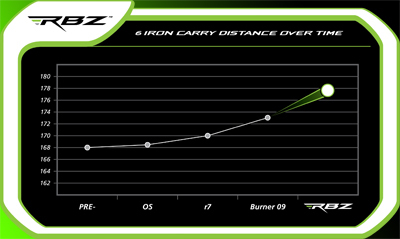 You’ll not only enjoy the feel, distance and forgiveness that come with the RBZ, but for once it’s a game-improvement iron that also looks real good in the bag.